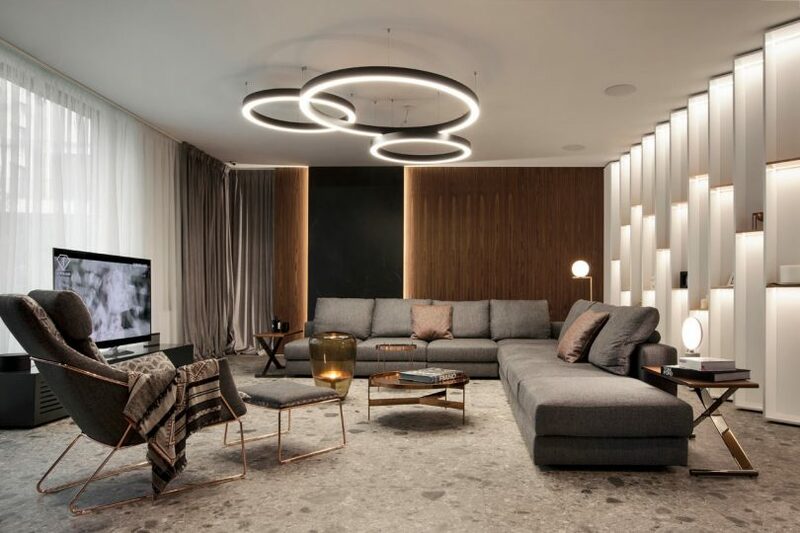 ALL in Studio was tasked with designing the SPV29 home in Sofia, Bulgaria for a young couple and their two children that’s located in a residential complex with building requirements. Their goal was to create a comfortable city retreat that’s both sophisticated and high-tech, and also close to nature. The interior leans heavily on black surfaces that are paired with warm woods and neutral terrazzo floors for a cozy yet modern aesthetic. To finish out the spaces, they incorporated copper and bass elements which add to the sophistication. The center island in the kitchen is all-black, right down to the sink, faucet, and stove. Surrounding it are walls of herringbone wood panels that hide the cabinets for a minimalist feel. The master bedroom also incorporates wood with the wall behind the bed covered in vertically notched wooden panels. Black toned glass separates the closet and the bathroom, which features a freestanding bathtub and a mirrored wall behind the sink cabinet. The children’s rooms mark a turn from the rest of the home’s decor with softer tones, open spaces, and playful surprises throughout.